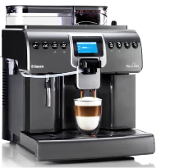 Super-automatic One Touch Cappuccino Anthracite machine 115V. Brews 7 coffee varieties. Coffee machine that meets and exceeds the expectations. Easy to set-up & Operate. 1- Removable Brew group can be cleaned in no time. 2- Bean hopper capacity: 1.7-lb. beans. .
3- .Removable 1.5 liter water tank with lift handle, for easy refill. 4- Pinless wonder Cappuccinatore auto frother. Steams & froths Milk from any Milk container, directly into cup. 4- Cup height adjustment from 2 to 8 inches. Pre-Ground Option to use different Beans. 5- Pre-brewing pause for strong aroma, customized to your taste. 6- Automatic rinsing cycle each time power is turned on or when machine goes itno stand by. 9- Option for using pre-ground coffee different from what is in the bean hopper. 10- Parts and after sale service, is availabile. 11- Hardness testing strip included with the machine to program Descaling reminders. Warranty: One year manufacturer's warranty for electrical parts and labor. BEST DEAL MODEL ON THE INTERNET.